For its first twenty minutes or so, Transformers: Dark of the Moon is not only eminently watchable, it’s also downright fascinating, putting forward—in a clever and calculatedly streamlined fashion—an Autobot-centered conspiracy theory behind the Space Race, leading up to Apollo 11’s lunar landing, that rivals some 1970s post-Watergate conspiracy thrillers. (One thinks of Capricorn One , with its Hollywood soundstage-fabricated mission to Mars, in particular.) In the best of these early scenes, Bay’s compositions skillfully combine staged reenactments and actual televised footage of Presidents Kennedy and Nixon exhorting the public on the necessity and urgency of putting a man on the moon (as seen on a TV monitor within the shot, a sophisticated and self-reflexive frame-within-a-frame). Which renders it all the more lamentable that the ensuing two-plus hours abstain entirely from both cleverness and sophistication. 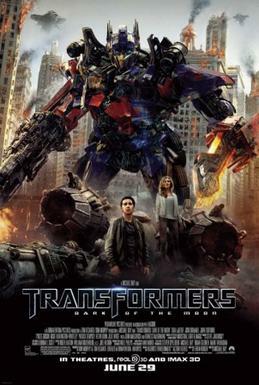 (On a purely technical level, the film remains impressive: the Transformers’ transmutations are rendered clearly and cleanly; the film’s many—and I do mean many—action set-pieces are often eye-popping, if ultimately brain-numbing.) Instead, Bay and screenwriter Ehren Kruger favor flaccid social satire (only hyperactive Ken Jeong and self-effacement-prone John Malkovich manage to register), wall-to-wall product placement (down to websites proclaiming price tags), rah-rah militarism (a nearly ubiquitous offense in Bay’s films) and, worst of all, instances that serve as prime examples of what Naomi Klein labeled, in the subtitle of her recent book The Shock Doctrine, “disaster capitalism”—that is to say, the systematic manipulation of events following a disaster (whether natural or man-made) to 1) line the pockets of corporate interests that step in to “assist” in damage-control and reconstruction and/or 2) use the opportunity to force a free-market economic system down the throat of an otherwise unwitting populace. Granted, T:DOTM doesn’t accomplish this literally—it merely reproduces the template on the level of image and metaphor, thus rendering it a bit more palatable to the American “imagined community,” the national collective consciousness that participates in a common “dream life” orchestrated (manipulated?) by the corporation-throttled mediascape. This entry was posted in film, movie reviews and tagged apocalypse now, apollo 11, capricorn one, ehren kruger, francis ford coppola, independence day, john malkovich, ken jeong, michael bay, naomi klein, space shuttle challenger, the shock doctrine, todd beamer, transformers: dark of the moon. Bookmark the permalink.